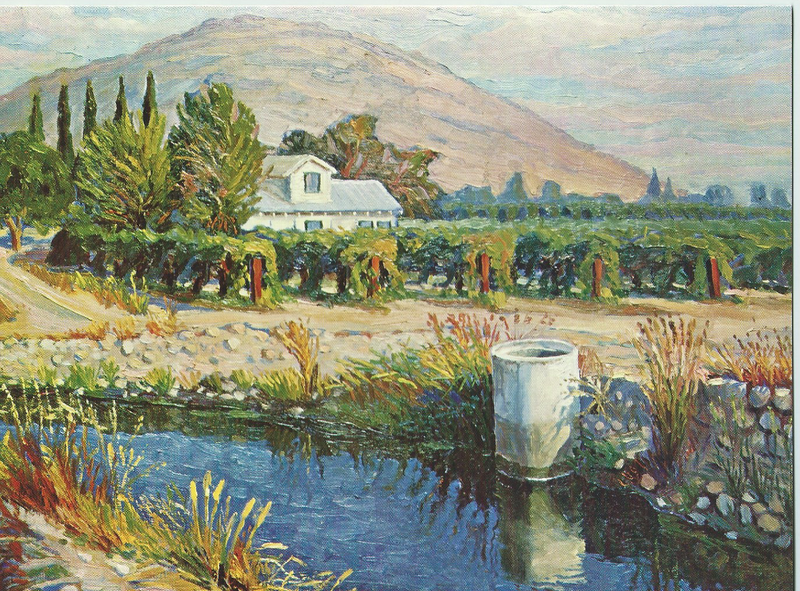 Before the building of the irrigation system the river had been wild, a torrent of water that tumbled and boiled out of the high Sierras onto the open plain. During the spring melt the river overflowed its banks, spreading widely over the land as it traveled its short path down to the tule covered basin of the valley floor. For most of the year, though, the river watered only the marshes in the lowlands and the narrow ribbon of green that bordered the river channel. The only plants that could grow on the arid plain beyond the river’s edge were drought tolerant perennials that could send roots deep down into the sub-surface ground water, or annuals that could take advantage of the winter rains then lie dormant during the long, dry hot months. The native plants had once supported huge herds of deer, elk and pronghorn antelope. For the Wechikit tribe of Yokut people who lived on the land where Reedley would later be built, the land was an abundant place—large mammals for meat on the plain and on the Valley bottom a great shallow lake that was home to beaver, turtles, ducks and other water fowl. Great flocks of geese and ducks descended on the lake to feed during the spring and fall migrations, and salmon from the Pacific Ocean worked their way through the tules to their spawning grounds in the spring. The Wechikit and other neighboring tribes moved easily between the foothills of the Sierra and the lake-filled valley floor, following the animals, taking advantage of the seasons. It was a good life, one that rested easily on the land, one that had been sustained generation after generation. What the Mennonites who arrived in Reedley in 1905 saw was a very different landscape. Cattle had replaced deer, elk and pronghorns; wheat and European weeds had replaced most of the native perennials and annuals. The Yokut people were long gone. Decimated by European diseases—small pox, measles, cholera, syphilis, they had been hunted, hounded, murdered first by Spanish and Mexican soldiers then by Yankees and Southerners from the lands east of the Rocky Mountains who saw the Great Valley as “empty land”—land they could claim for their own, settle and exploit. By 1855, when James Smith established a ferry and hotel on the high east bank of the Kings River where Reedley now stands, the conquest of the Yokut tribes was almost complete. The vast Valley was now open for the taking. A land grab began with ambitious, aggressive men staking out huge tracts of land. The Valley became a land of enormous ranches run by a few powerful, wealthy men. In 1857 the land along the banks of the Kings River became part of the “76 Ranch,” so named because it covered 76 sections—76 square miles, a total of 48,640 acres. When first created those ranches were part of an unfenced open range grazed by cattle and flocks of sheep. Next came wheat, vast fields that eventually covered the east side of the Valley, fields so enormous they required huge gangs of plows and long lines of big, long-legged mules to plow them. The years when wheat ruled the land around Reedley was fairly short. In early 1880s, the leading ranchers in the area decided to finance the scheme of a civil engineer, P. Y. Baker to use the waters of the Kings River to create an irrigation system that could irrigate a tract of 30,000 acres on the left bank of the river. With irrigation the land could be broken up into smaller parcels and sold for intensive farming. The 76 Land and Water Company was formed, and by the end of 1884 the irrigation system was in place. The stage was set for a new type of settler, people who were farmers rather than ranchers. Reedley was not the California paradise of orange trees and balmy coastal weather, nor the paradise of giant Sequoias, mountain peaks and delicious summer breezes described in the promotional literature published and distributed by the railroads and other California boosters. For nine months out of the year the town and the land around it were brown and dusty. During the long summer that began in early May and lasted well into the fall it was broiling hot. This was a town tourists passed through only of necessity, passed through as quickly as possible. It took experienced farmers from the plains and prairie states to see this land around Reedley as a paradise, a promised land. Mennonite farmers were not looking for scenery. They were looking for farmland, and what they saw was good soil—sandy loam that is a farmer’s joy, fertile, easy to plow, well drained. And water, irrigation water they could depend upon. The system of canals and ditches that diverted the water of the Kings River and carried it out to the farm plots meant that there would be no more waiting for rains that didn’t come, no having to watch crops shrivel and dry. That dependable water turned the long, hot, rainless summer into a growing season that could last 300 days in a year. And the lack of trees, the flatness of the terrain, meant that the land could be quickly brought under cultivation. This land with its mild winters was a land that could grow almost anything, land where a farmer did not have to depend upon a single crop. It was also close to the markets of Los Angeles and San Francisco. Now was the time to buy, now while those who owned the land were eager for buyers and settlers. This was land to acquire and hold on to. Prices could only go up. Descriptions of the land and its promise were included in letters to family and friends back home. Word quickly spread throughout the Mennonite network of churches. To these farmers of the prairies and plains this land at the base of the mountains sounded like an earthly heaven, a paradise of good soil, dependable water, mild winters. No tornados, no blizzards, no swarms of grasshoppers, no anxious watching for rain that never comes. The Census of 1920 gives the population of Reedley as 2,447. Its Mennonite churches could seat almost all of that population on a single Sunday morning. [ii] Reedley: A Study of Ethnic Heritage. (Reedley Historical Society, 2nd printing, 1996), p.14. [iii]Loewen, Ted, ed. Reedley First Mennonite Church: the First Seventy-five Years: 1906-1981. North Newton, KS: Mennonite Press, 1981. [iv] Beginnings in the Reedley Area. Compiled by Katharine Nickel. (Reedley, CA. 1961), p. 236. [v] The General Conference was formed in the mid-nineteenth century by Mennonites in the mid-western United States who were critical of what they saw as “the formalism, legalism, and outmoded ways of the ‘old’ church.” Historian Theron Schlabach notes that “compared to most Mennonites in America they were decidedly progressive. They supported mission, education, and Mennonite union, and they believed generally that change would bring progress.” Theron F. Schlabach,. Peace, Faith, Nation: Mennonites and Amish in Nineteenth-Century America . Scottdale, Pennsylvannia; Waterloo, Ontario: Herald Press, 1988, pp. 127, 128. [vi] Jost, Esther. The Church Alive in its 75th Year, 1905-1980. The Anniversary Committee, 1980. Note: To read earlier chapters, click on the desired title in the “Chapters” section of the sidebar or at the bottom of the page. Thank you. Your exclamation point makes me happy.